The Blue Bloods vowed that their immortal status would remain a closely guarded secret. And they kept that secret for centuries. But now, in New York City, the secret is seeping out. Schuyler Van Alen is a sophomore at a prestigious private school. She prefers baggy, vintage clothes instead of the Prada and pearls worn by her classmates, and she lives with her reclusive grandmother in a dilapated mansion. Schuyler is a loner... and happy that way. Suddenly, when she turns fifteen, there is a visible mosaic of blue veins on her arm. She starts to crave raw food and she is having flashbacks to ancient times. Then a popular girl from her school is found dead... drained of all her blood. Schuyler doesn't know what to think, but she wants to find out the secrets the Blue Bloods are keeping. But is she herself in danger? Schuyler Van Alen is an outcast in her school, Duchesne, along with her two best friends, Oliver and Dylan. They had never fit in, and were content with the way things were. But now things have changed. Jack Force, the heart-throb of the school, is suddenly paying attention to Schuyler. People are not who-- or what-- they seem. Schuyler undergoes a life changing transformation that will mark her as special for the rest of her life. Can she juggle this all, and the realization that she, or anyone she knows, is no longer safe? A “blue blood”, by definition, is an aristocrat, or a member of the aristocracy. Melissa uses a delightfully darker play on these words when the elite of her society, the top of the social and wealth ladders, are actual Blue Bloods-- vampires. These vampires do live forever, but not in the conventional way. Their blood is the key to their ongoing lives. The idea for this was fascinating to me. I never really got too attached to any of the characters, but I did like all of them, even Mimi. They all had a certain personality and characteristics that made them unique and interesting. Schuyler is reserved and a little naïve, yet confident in herself and who she is, which is refreshing. Oliver is obviously in love with her, and I liked him, although I definitely prefer Jack as a love interest. Melissa de la Cruz has a way of writing that flows well and gives us a vivid image of the scene. Lots of fashion is involved, and even though I couldn’t dream of owning some of the clothes described, I could still picture them clearly in my mind. 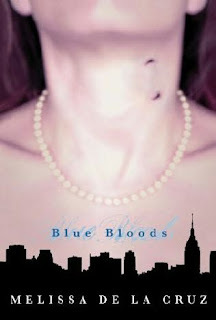 Blue Bloods, for me, was an good experience and a book worth reading. I was instantly captivated by Melissa De La Cruz’s realistic characters and unique plot-line. Jack and Dylan were by far my favorite characters, and I’d really like to see the relationship between Schuyler and Jack progress. I give this novel 4 out of 5 stars. Glad you enjoyed it! I've read most of this series and it is good, I enjoy the slightly alternative vampireness in it, it's interesting. The Blue bloods series is one of my all time favorite reads! Will you continue with book 2? Wait 'til things w/Sky and Jack begin to develop... HOTT! :)haha! Glad to see you enjoyed it! thanks for sharing your thoughts! ps. Cuteee blog! I shall follow! I see that Wither is on your reading list- I'm about to start it, and I'm so excited! What do you think so far?? @Lisa: Wither is FANTASTIC! I love it so far, it's so creepy and... omgoblins it amazing! Great review Ashley! I have this on my shelf and it's been sitting there for quite some time. I'll be getting to it soon, looking forward to it.